A traditional, small, family-run business, we cater to families, couples, business persons and small groups. We do not book stag / hen nights or drinking parties. 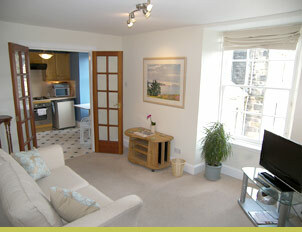 Check Availability of this Apartment Now! No obligation - we'll get back to you shortly with availability and pricing for your group size and season. Important: If you do not hear from us within a few hours, please check your junk mail filter (bulk or spam folder). * Ensure you enter your correct email so our reply gets to you. We won't share your email with anyone else. Stay right in the heart of Edinburgh's Old Town in our delightful Royal Mile Self-Catering Apartment - the best possible base for exploring central Edinburgh's historic sites! 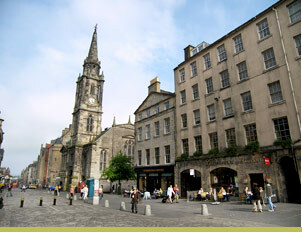 Fashionably located in Edinburgh's café society district, this bright and modern apartment lies on the central pedestrianised precinct of the Royal Mile between St. Giles Cathedral and the Tron Church, under 5 minute's walk from Edinburgh Castle. The Palace of Holyrood House, Waverly Railway Station and Scottish Parliament are all within a stone's throw. 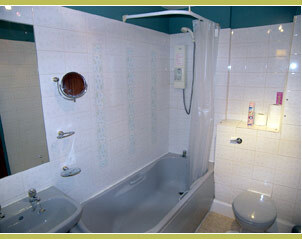 Competitive rates - please enquire for current rates according to season and your group size. This apartment can be configured to sleep anywhere between 2 to 4 people in complete comfort. This comfortable 3rd floor apartment, with lift/elevator, is situated in a peaceful private complex with secure entry system. The accommodation includes fully fitted kitchen with all modern conveniences, double bedroom, sitting room with three-quarter-size double bed settee, bathroom with bath and power shower, and a flat panel LCD TV with DVD player for your own movies. Please use the 'Check Availability' form on the right to obtain a price quote for your group size taking season into account.We are happy to quote for different numbers of guests. Included in the price of all of our apartments are all bed linen, towels, kitchen towels, toilet rolls, soaps, and a grocery starter pack which includes tea, coffee, sugar, milk, cooking oil, orange juice, preserves, spreads and bread rolls. 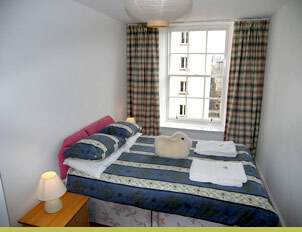 Can sleep up to 4 in comfort (1 double bedroom, 1 comfortable fold-up double bed settee in living room). 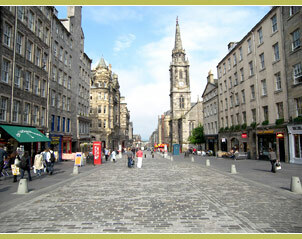 Fashionable "café society district": The apartment lies in the pedestrianised zone of Edinburgh's famous Royal Mile. 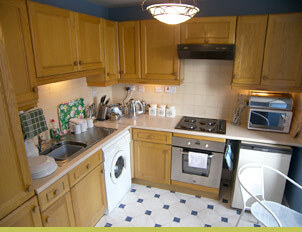 Fully fitted kitchen with all conveniences and bathroom with power shower. ©1988 - 2019 Edinburgh City Homes Ltd - Self-Catering in Edinburgh, Scotland.